Jawa Campers on Queensland’s beautiful Sunshine Coast have been working hard for quite a while to produce the complete mini hybrid package. 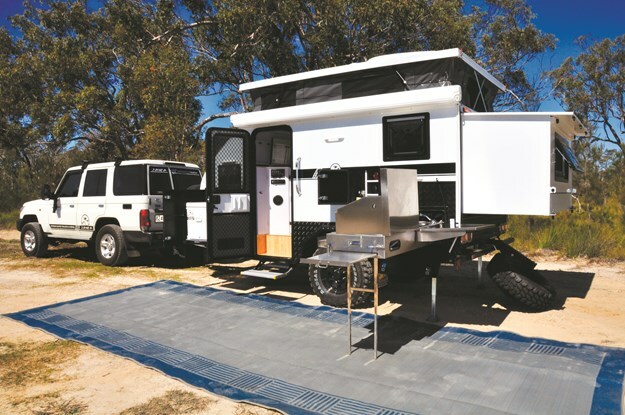 They had a huge attempt with last year’s Camper Trailer of the Year when they presented the first Trax 12, but the new ensuite model sets a whole new standard. After taking it for a spin, I think this complete little hybrid camper trailer is destined for great success. It combines sensible weight with a tough offroad trailer, an appealing layout with extendable bedding, a complete kitchen, suitable water and power supplies, ample storage and an internal ensuite, all at around half the price of many of its hybrid competitors. The Trax 12 Ensuite is a very smart camper, but it also has the brawn to carry you safely across this harsh land and all its cuts, crags, crevices and corrugations. When you arrive at your ideal campsite, or maybe even just park up for a quick overnighter, the set up time is absolutely minimal, yet the facilities are huge. The Trax 12 Tare of 1790kg is testament to the construction of the little hybrid. It’s a rugged little customer with the balls to take on the rough stuff. The foundations are the fully welded and galvanised box-section chassis with independent trailing arm suspension with dual shocks and coil springs each side, riding on 265/75/R16in mud-terrain tyres and steel mags with 12in electric brakes bringing the ATM up to 2400kg. It tracks beautifully on the bitumen and tags along through the rough with high ground clearance and a terrific departure angle that didn't drag its bum at all, even when we found a series of deep bog holes to play in. The weight is kept down low, giving it good upward stability – especially when you fill the twin 100L stainless-steel water tanks that are well recessed into the trailer frame. The overall weight is comparable to most of the popular forward folds, but the Trax 12 Ensuite has none of the canvas set up. There's nothing strenuous about making camp. 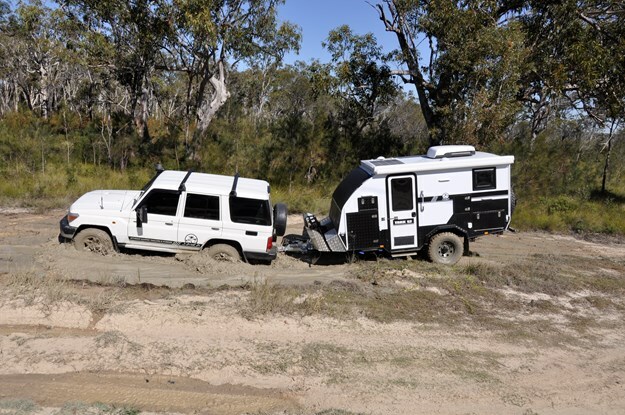 Choose your ideal site, disconnect the towing vehicle if you wish via the off-road coupling, wind down stabilizers as needed and pop open the cantilevered roof. I initially had some concerns with the fold-out bed extension on the rear of the trailer, but a little more familiarity has perhaps proven me wrong. You simply tilt the pivoting spare wheel carrier down on its easy gas strut mechanism, lift the lid and fold out the base and sides to extend the internal reach of the camper to around half of the two-piece Queen bed mattress. It extends the internal footprint enormously. That isn't the only surprise in this innovative little hybrid. While the rest of the internal layout and features are roomy and accommodating, the real winning margin is set by the inbuilt ensuite that will attract many campers both young and old. It is a very neat unit set on a fully molded fibreglass shell that features its own Thetford cartridge-style toilet. It also contains a hot and cold shower with a height-adjustable rose fed by a Douetto gas hot water service. The amount of space is quite impressive, and that includes the headroom due to the soft-sided pop-up, complete with zippered windows and flyscreens. The roof is a story on its own! It is constructed from double-laminated and insulated fibreglass panel – nothing unusual from that. However, Wayne took a hammer to a sample of the laminated material back in the workshop and it didn't even bruise! There is a small dinette with its upholstered sofa over the wheel-arch creating just one of the many storage cavities, plus a removable pop-up table that doubles as an external free-stander. Opposite is a surprisingly large closet, complete with shelving and hanging space and a handy flat top for overnight knick knacks, or maybe a portable TV if you are so inclined. The internal aesthetics are similar to the white panels and black trims of the exterior, except they are lifted by gloss laminate benchtops, a faux-leather lounge and timber-look flooring. The fully lockable caravan style door comes complete with security mesh insert. As you open it and step inside there is a vanity/utility cabinet area with a fold-up bench top that reveals the sink with hot/cold mixer, a mirror and a tonne of convenient locker storage in the surrounds. On the outside, you'll find the slide-out stainless steel kitchen that tracks out from under the bed. It's a well presented and appointed stainless steel kitchen with a four-burner gas stove and high wind guards, a sink with hot/cold mixer, a pull out bench extension from the end and a fold over bench from over the sink plus cutlery/utensils drawers. Near the kitchen is also a pull-out slide compartment for a generously large portable fridge. Mounted conveniently on the face of this cabinetry are: 240V and 12V power outlets; digital display volt, amp and water gauges; a complete stereo system with twin speakers and a fused switch panel for the multitude of appropriate LED lighting, including exterior and interior illumination; plus overhead and reading lights. 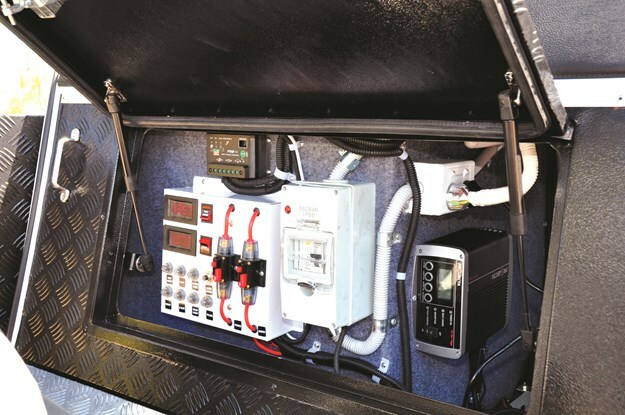 The electrical power is driven by twin 120A AGM batteries with solar panels now fixed permanently to the roof. There's an AC/DC charger from the 240V input plus the Anderson plug from the towing vehicle. The pièce de résistance is the Truma reverse-cycle air conditioner mounted up on the roof panel. Whilst it does increase the clearance height, you will be thankful for its inclusion in Australia's climatic extremes. Out front is a 150x50x4mm galvanised A-frame drawbar with an ARK XO Extreme offroad coupling and breakaway connection and handbrake. Next comes a checkerplate alloy stoneguard in a steel frame protecting twin jerry can and 9kg gas bottle mounts, plus a lockable tool box either side. The front of the box shell has a replaceable clip-on vinyl wear panel to keep your prized Trax 12 Ensuite looking great up top, plus a full-width boot that also contains the main electrical panel with isolators and circuit breakers, Projector 25A charger, solar panel controller and switchgear. On the kerb side you'll find the main door with separate security screen, illuminated handle and a pull-out step. 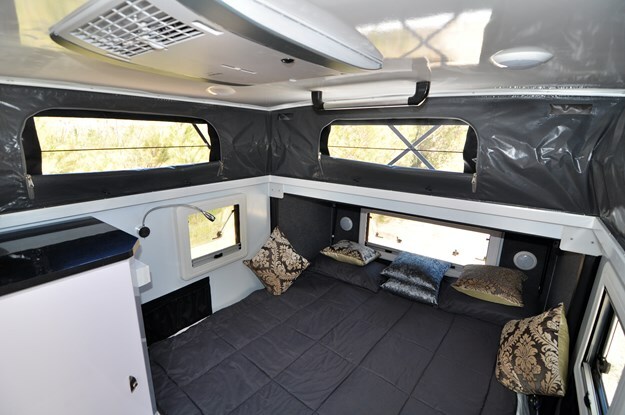 There are three double-glazed windows to lighten the camper each with its own sliding fly screen and blackout blind for a nice sleep-in or cat nap. 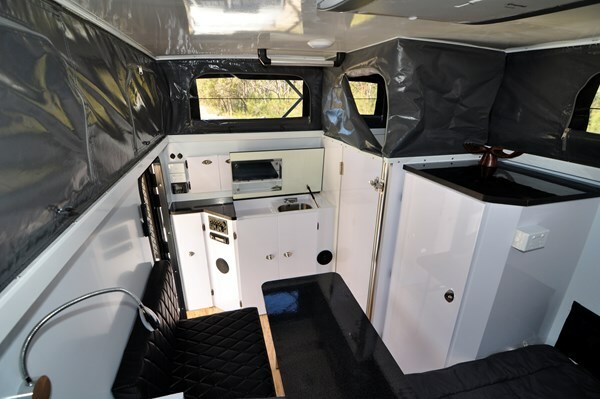 Around on the offside are the water and power inlets, the hatch for the toilet cassette, an external pull out shower and a large storage compartment all with dustproof seals and compression locks. Overhead is a roll-out awning that now has a full set of enclosures that extend the livability dramatically. You may only wish to assemble one or two ends depending on your campsite and duration of your stay, or perhaps none at all in ideal conditions; it’s totally up to you. 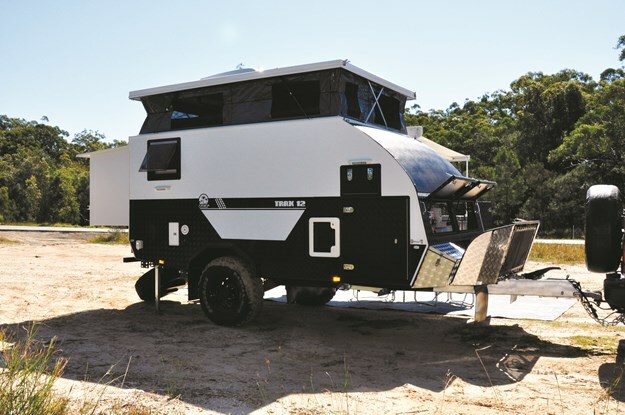 At well under $40k for the whole kit-and-caboodle the Jawa Trax 12 Ensuite camper trailer is a very attractive small hybrid that would suite a wide range of travelling campers. 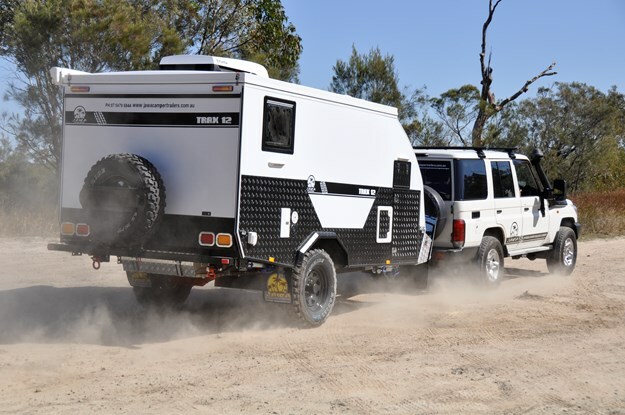 Yes it is an imported camper, however, Jawa in Australia have worked very hard to ensure that the standards are set high while the price has been kept very reasonable. This Trax 12 Ensuite version has an ideal layout and a comprehensive range of sensible features. Keep an eye out at Australia's best offroad destinations as you will no doubt find plenty of happy little Trax 12 campers in the future.